I tried counting sheep. I rose off the ground. With all of my might. And a handful of pie. Became an infatuation. Pass the cranberries please. Flung open the door, May your turkey be plump. With goodies galore. Have nary a lump. Beans and tomatoes. Stay off of your thighs! AMEN! The Banner Kit was unveiled at the meeting via a PowerPoint presentation. The committee was made up of Donna Huss, Gary Smiga, Jesse Gaither and Greg Griffin. The items will be used at all CNO events and the tent can be rotated to highlight either the golf outing, the Avenue of Flags, the Christmas tree sales or CNO 2.0. The items are very colorful and will be a positive image for our organization. Thanks to Diane Arehart for putting together a “to go” box which will hold event brochures, membership applications, CNO 2.0 information and a list of upcoming events. This box will be stored with the Banner Kit and will be easily available when the Banner Kit is used. Christy Gariety announced she is handling the Adopt-A-Family program. See her to sign up. Laurie Poeppelman announced Optigear orders are in and today is the last day for size and color samples. Orders placed will be received in 2 weeks. Gary Hansen, chair of the Will Cale Scholarship Committee, announced he is still looking for more mentors so that we can help more students. Beth Duncan reminded everyone about the December 11th Holiday Party at the Presidential, the Dinner and a Mystery on Dec 28th @ 7pm @ the Spaghetti Warehouse and she thanked everyone who brought chili, soups, cookies, corn bread and other food. Donn Huss announced that Myron Rheaume will be available to discuss PGI/PDP next week. Please meet with Myron next week at lunch to begin filling your passport. Many of you have achieved Level 1 and just need to complete the booklet. You can also touch base with Myron to see what level you might have already achieved. Donna Huss introduced Tom Henderson, the superintendent of Centerville Schools and member of CNO. Tom presented three Youth Appreciation Awards to honor 3 outstanding students who will be great ambassadors of Centerville High School. Tom introduced Beth Buck, a CHS South Unit Guidance Counselor, who introduced CHS Senior Madison (Maddie) Round. Maddie has an impressive 4.11 GPA. She is dedicated to the CHS girls golf team and is well-known for her four-year involvement. She works at Yankee Trace Golf Course. She is president of the Centerville Octagon club. She speaks each month at the meeting of 180 of her pears. Maddie participates in many service activities such as making and sending birthday cards to young kids who are in the hospital, as well as organizing Christmas caroling at a local nursing home with the Watts Middle School Junior Optimist Club. Maddie spoke briefly. As a member of DECA they were in the top 10 in the State. She plans to major in Marketing at Miami University in Oxford. She thanked CNO for our service to the community and making a difference. She also thanked us for this honor. Tom introduced Kinsie Miller, a CHS West Unit Guidance Counselor, who Introduced CHS Senior Sisters Rachel and Emily Whitehead. Rachel and Emily Whitehead both have very impressive high school resumes. They are both involved in volunteer work, athletics, clubs and organizations. Rachel is a four-year member of the student council. She is also a two-year member of Chemistry Buddies, was chosen from a select group of seniors to be an Elk Connector where she serves as a mentor to ninth grade and new students. She also was chosen to be a lunch buddy where she serves as a mentor to an at-risk elementary aged student. Rachel is also a talented musician, playing in the wind symphony for three years and being a member of United Sound for two years. Rachel is a four-year member of the CHS cross country team and the track and field team. Rachel is ranked third of 657 students with a 4.9366 GPA. She is a two-year member of National Honor Society and she is also a two-year member of Spanish Honor Society. She has earned the Commended National Merit Scholar. She is expected to receive the Ohio Honors Diploma in May of 2019. Rachel Whitehead briefly spoke and thanked CHS teachers and counselors. She plans to study Neuroscience, hopefully at Duke University. Next Kinsie Miller discussed Emily Whitehead on behalf of Samantha Stingley, a CHS East Unit counselor who was ill today. Kinsie used notes from Samantha to introduce Emily. Emily has taken tough courses at CHS including AP Stats, AP Chemistry II, AP Literature, AP US History, AP Government, and AP Microeconomics. 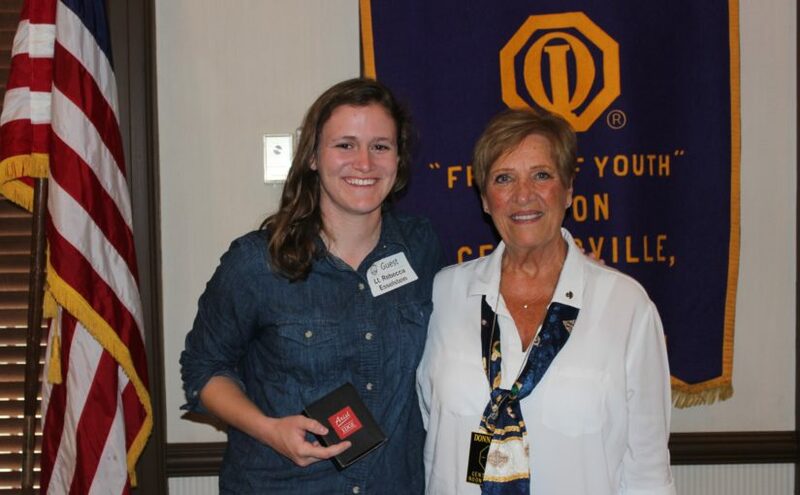 Emily has been involved with Centerville Women’s Soccer Program and the music program. She is a member of multiple clubs and service groups, including Junior Leadership Dayton. She is a mentor to younger students. As an Elk Connector, Emily helped welcome nearly 700 new freshmen to CHS. In August she “adopted” a group of 20 students to mentor throughout the year. Emily uses her time before and after school to volunteer as a Chem Buddy, tutoring Chemistry I students. Emily is ranked fourth of 657 students with a 4.9186 GPA. She is a two-year member of National Honor Society and she is also a two-year member of Spanish Honor Society. She is expected to receive the Ohio Honors Diploma in May of 2019. Emily Whitehead briefly spoke and thanked Mrs. Stingley and CNO for this honor. Her number one college choice is Georgetown University. Bob Duffy Eating food off of the Birthday table, AGAIN! National Philanthropy Day was November 15, 2018. 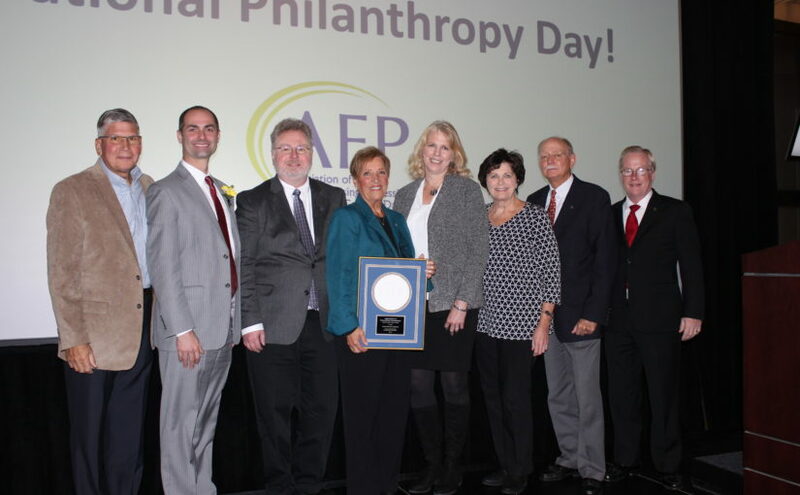 On this day, the Association of Fundraising Professionals Greater Dayton Region held a luncheon event at Sinclair Community College’s Ponitz Center to recognize Dayton Area Philanthropist individuals and organizations. 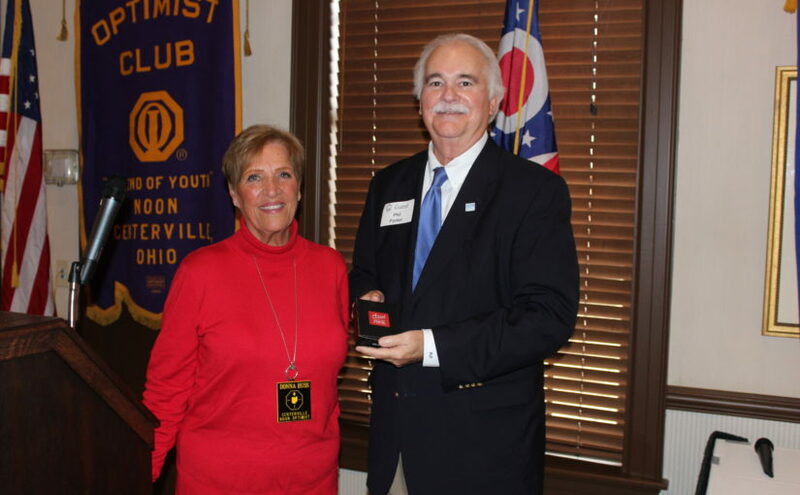 The Centerville Noon Optimist Club (CNO) received the “Outstanding Organization” Award. We were nominated by Dayton’s Children’s Hospital. CNO donates significant money every year to Dayton’s Children’s hospital. Each year CNO sponsors three Build-A-Bear activities for pediatric patients and their families. CNO provides the funding and the volunteers to give a little joy to the lives affected by childhood cancer and Sickle Cell disease. Donna Huss, the CNO president accepted the award, a beautiful plaque, on behalf of our club. CNO helped sponsor the event by purchasing a table of eight. Eight members of our club attended the event. The event was well done and the facility was top notch. Each recipient took a few moments to speak to the people attending the event. Here is a list of the individuals and groups recognized. Everyone who is a member of the Centerville Noon Optimist should be very proud of receiving this award. Recognition like this will help us do even more good for our community. Heavenly Father we will never be lonely if we like the person we’re with. It is always true when we are with You. Have us realize that when we are with You we are filling ourselves with Your love. That love is not to be hoarded for our own consumption, but is to be spread to all we encounter. Love and hate are two emotions that we harbor. Have us whistle a happy tune for being happy there is no room for hate.Amen! The USO thanked us for our donation of $1000 for their holiday party. The Victoria Theater Association thanked us for our donation to their National Geographic Program. Beth, social committee, announced that 60 people have signed up so far for the Dinner and a Mystery. You can still sign up. They can handle up to 90. The event is December 28, 2018 at the Spaghetti Warehouse. Beth also announced sign-ups for the CNO Holiday Party on December 11 at Presidential Banquet Center. Greg Fay, CNO 2.0 chair, announced there will be no CNO 2.0 meeting for December 2018, but he plans to have a football viewing party some time. Donna Huss introduced Greg Griffin, the co-chair of the Christmas Tree Lot. Greg wants to make sure especially new members get briefed on how the Christmas Tree Lot works and why. The why is simple, “We do it for the kids.” First Greg showed us a great video about the tree lot and then he stepped us through his Power Point deck. Please review the slide deck here for additional information not included in the rest of this article. 2018 is the 51st year of our tree lot. Greg Griffin and Karl Frydryk are the co-chairs of the Christmas Tree Lot. It is one of our 3 major fundraisers. We will unload and sell 1,000 trees in about 15 days. It is a great club showcase opportunity to be involved with the community. Customers mention over and over that it isn’t Christmas until they buy a tree from us. We have a new storage trailer this year with LED lighting and power and new wreath hangers. We will have student volunteers from Centerville High School and the University of Dayton. We cannot park in the Centerville BMV parking lots when BMV is open. Park at the Famous Restaurant, the Bank or the Walgreen’s. Please avoid parking near the front entrance of these businesses. Ask parents before you give their kids a candy cane. The only person allowed to change the price on a tree are Greg or Karl. Don’t negotiate the price. Remind customers if they ask for a discount that our trees are of the highest quality and we are fundraising to support youth in the community. We have occasionally agreed to donate a tree for a few needy causes. There is a form to fill out and someone will investigate that the request is legitimate. Tree Delivery Day is Saturday November 17, 2018 at 8 AM. We need all hands on deck. We are usually done by 11AM. We have jobs for everyone. You will be rewarded with donuts, coffee, hot chocolate and about 15 types of hot soups. Lot opens the day after Thanksgiving. We are scheduled to be open through December 15th. History shows that we will sell out in 15 days. When you arrive at the lot, go into the sales trailer, mark that you were there and grab your name tag. If you can’t make your shift, try and find a substitute or trade with someone else. You do not sign up for the tree lot. You have been automatically signed up for a team. Each team has 6 shifts, except one has 7 shifts, but the lot should be closed before that. Please show up for your shift. You will receive emails telling about your shifts. There are 9 evening teams and 1 day shift team. There are 10 Team captains. Wear proper clothing. You should bring Gloves and Boots. Please be aware that you will get tree sap on your gloves, clothes and shoes. We do provide tree delivery. It is available within 7 miles for $10. We do not take the trees inside homes. Remember to push the Tree Sprays because we make them out of tree scraps so it is pure profit. There is a Christmas Tree Ornament for sale at the lot as well. Tell your friends to come early to buy a tree. We will sell out early. Our trees are of the highest quality. There is a Christmas Tree shortage again this year. If you work enough shifts you can get a discount off the purchase of a tree. We have a truck we borrow from Voss for tree delivery. It is very important though that before you drive the truck you must make a copy of your license and sign the driver log. Thanks for being a member and helping with one of our very successful fundraisers. We can’t do it without the generous time of our members. No time for sergeants this week. The Veterans Service Flag pin was created to distinguish and honor persons who have faithfully served in the Armed Forces of the United State of America. The red background of the Veterans Service Flag represents valor, hardiness and the blood spilled by Americans who made the ultimate sacrifice for freedom; the blue rectangular field represents justice, vigilance and perseverance; and the white star represents purity, liberty and freedom. Wear the Veterans Service Flag Pin Proudly! President Donna Huss bestowed the Flippin’ Awesome Award along with a bag of Flipz pretzels to Gary Aiken, Debe Dockins and Chris McAlpine for the great speakers they arranged for our October meetings and to Larry Lynde for assembling a great speaker committee. Gary Hansen, chair of the Will Cale Scholarship Committee, announced its next meeting will be at 5:30pm on Wednesday, November 13 at Gary Hansen’s house. All current and prospective committee members/mentors are encouraged to attend. We will be discussing the status of our current scholars as well as reviewing our candidates for the 2019 scholarships. The committee is looking for a few new committee members/mentors. If you are interested, please contact Gary Hansen for further information. Gary Hansen also announced that the wreaths for this year’s tree lot will be picked up in Bath Township on Wednesday, November 20 at 9:00am. He is looking for 2-3 pickup trucks (or a commercial box truck or trailer) along with a few helpers to pick up the wreaths and bring them to the tree lot. Please contact Gary Hansen if you can help. Beth, social committee, announced that 50 people have signed up so far for the Dinner and a Mystery. You can still sign up. They can handle up to 90. The event is December 28, 2018 at the Spaghetti Warehouse. Jack Anderson, CNO 2.0 Committee, announce that the next 2.0 meeting will be held November 15, 2018 at 5:30 at Heavier the Air Brewery. Our speaker will be Anthony Rocco, Dayton Freight Lines, Inc. VP of Operations. Greg Griffin, chair of the Tree Lot, announced that the trees will be delivered by 2 semi-trucks on November 17, 2018 at 8:30 AM. We need anyone that can come that day to come help unload the trees and get the bottom drilled. The tree lot opens on Friday November 23, 2018 at 9 AM. Hours of operation are 1 PM – 9 PM Weekdays and 9 AM to 9 PM Weekends. The tree lot tear down will be Sunday December 16, 2018 at 11 AM. Today, November 6, 2018, is Charlie Tapp’s birthday. Charlie showed up for today’s meeting knowing the intensity of the situation. Bob Duffy led us in singing an excruciating rendition of Happy Birthday to Charlie Tapp. Gary Aiken introduced Phil Parker, the President of the Dayton Area Chamber of Commerce. He shared with us his thoughts on the local economy. The Dayton Chamber is a regional chamber. It is the 25th largest in the U.S. It has members in 9 counties: Montgomery, Champaign, Greene, Warren, Butler, Clarke, Darke, Shelby, and Miami. The unemployment rate in our area is 4.7%. That is the lowest in decades, though slightly higher than the national average. Low unemployment is a double-edged sword. The number one concern for area employers is the availability of skilled workers. He said we should continue to watch what is going on north of town for the distribution centers being built, including for pet supplier Chewy.com. Dayton has created a niche market for distribution. North Dayton is great for distribution because of the access to highways and the airport. The next biggest concerns for area employers is health costs and opioid addiction. Phil also discussed downtown Dayton. The University of Dayton is going to take control of the old Montgomery County Fairground’s 37 acres. This is just to the south of the downtown business district. Care Source is a great employer for the downtown area. They have taken over several buildings and are now taking over the former Elder-Beerman building and others. At some point Care Source plans to consolidate their employees into a single building. He is seeing some growth downtown from smaller employees. A lot of younger entrepreneurs are looking for non-traditional locations for their businesses and are choosing renovated buildings downtown. The Dayton Convention Center is owned and operated by the city. Normally this would be run by the county. Phil thinks the building needs some repair. It has slipped over the last 10-15 years. A group has looked at it recently to try and fix it, but the city alone may not have the funds. A combination of County, City and port authority may work together to improve the facility. It is a regional asset not just benefitting the city and more entities should share in the cost to renovate the building. Two new hotels have been announced for downtown. This creates more opportunity for new businesses to locate downtown and will increase the use of the Dayton Convention Center. Residential housing continues to grow downtown. Charlie Simms plans on building 12 or more units costing more than $600,000. A lot of people are looking to move downtown. Empty nesters don’t have the same concerns about schools as younger people and are more willing to move into Dayton. There are still several cheaper places to purchase downtown as well. Myron Rheaume introduced Craig Boring, the Executive Director of the Optimist International Foundation. 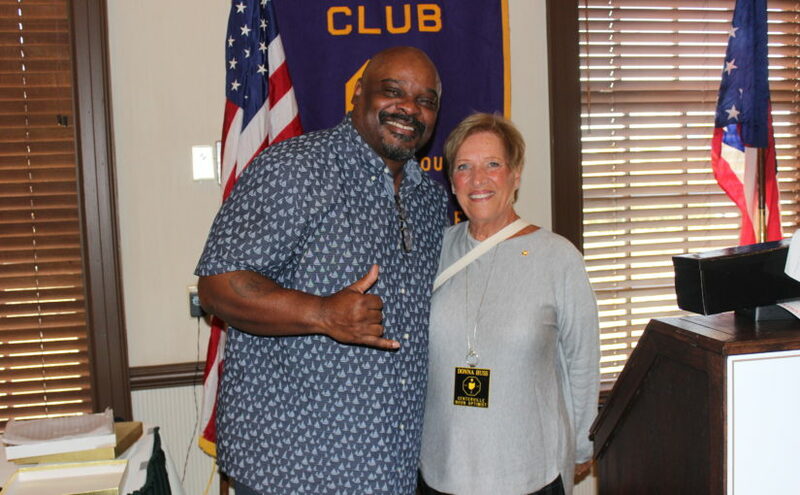 Craig told us that the Optimist International Foundation is the fundraising arm of Optimist International and works to develop funds to support the endeavors of Optimist International and its mission. Craig also spoke to us about the Optimist Oratorical contest. Optimist International has held the Oratorical contest since 1928. The foundation helps to organize and fund this contest. This year the finals were held in St Louis. One of the contestants in recent years, Dominic, has a speech impediment. Her therapist told her to get into some oratorical contests and one of them was ours. Overcoming her disability, she recently won second place and that came with a $17,500 scholarship. He wants us to know that by donating to Dime-a-Day you are not just getting a certificate, you are truly helping youth. Would YOU like to participate in Dime-a-Day? It’s easy and very inexpensive – the donation form is here. Jerry Stahley Interesting clothing at the tree lot setup. Joan Cordonnier Husband doing well after his 5 bypass surgery. Has been walking up to 3 miles in the neighborhood each day. Thanks for all the cards, texts and well wishes. we neglected to encourage. Then when we bend our head, have us pray they grow in their love and get better every day and don’t let us forget to include ourselves. Amen! Bill Stone, chair for Dime-a-Day, will be accepting checks and forms for Dime-a-Day donations this week. You can also send the form and your check in yourself or give them to Bill on a later date. Get the form here. 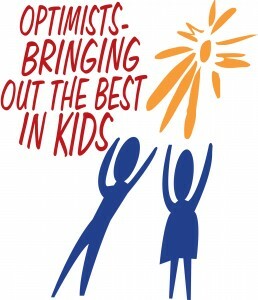 Optimist International and Optimist International Foundation coexist as two separate organizations that support each other. Optimist International Foundation is the fundraising arm of Optimist International, and works to develop funds to support the endeavors of Optimist International and its mission. Nancy Lehren, Childhood cancer chair, thanked everyone for the successful Build-a-Bear on October 25, 2018. Myron Rheaume, Personal Growth chair, will offer PDP and PGP instructions before and after next week’s meeting. Beth Duncan, social chair, announced there will be a Dinner and a Mystery on December 28, 2018. It will be at the Spaghetti Warehouse. Ickey came today to tell us about the foundation named after his son, the Jovante Woods Foundation. The foundation concentrates its efforts in the areas of treatment and education for Asthma and Organ Donation. Ickey shared some stories about his life and football career. He was born in Fresno CA. He received a full ride scholarship at UNLV. The first 3 years were difficult, but John Montgomery, his coach, treated him as a person. Ickey said that John told him, “Give me 110% and I’ll get you into the NFL. Just do everything I say.” Ickey did what John said. Ickey was the first player drafted in the second round. He was not a great student, but he loved football. He was part of the most explosive offense in the league and made it to Super Bowl XXIII in January 1989 with quarterback Boomer Esiason. During that great year, Ickey created the famous Ickey Shuffle. His career ended quickly after 4 years because of injuries. Luckily, he had the gift of gab and went into sales doing whatever it took to put clothes on his kid’s backs. Ickey’s son, Jovante Woods, was an extremely bright student with a 3.8 GPA. He was athletic, caring and was going to have a great academic career. On August 14 2010, Jovante Woods passed away from a severe asthma attack at 16 years of age. Ickey remembers getting the worst phone call a parent could ever get that his son couldn’t breathe. By the time Ickey got home, his son was in the ambulance. They were trying to resuscitate him. They decided to airlift him to Cincinnati Children’s hospital. His son had lost a half hour of oxygen to the brain. They waited to see if the brain swelled, since there was nothing they could do if it did. The brain scans were completely black instead of showing the folds of the brain in a normal scan which indicated there was severe swelling of the brain. Shortly after Jovante was pronounced brain dead, two ladies showed up from “Life Center”. They explained that Jovante had chosen to give away his organs on his driver’s license in the event of death. This was very upsetting to Ickey and Chandra (Jovante’s mother) at first. After giving their condolences, the ladies asked them how they felt about Jovante being an organ donor since parents of minors have the ultimate decision. After calming down, Ickey and Chandra decided to honor Jovante’s wishes. Jovante Woods’ organs saved four lives and helped countless others using tissue donations. Asthma: We strive to increase asthma awareness, screening locations, education to families in need and efforts to find a cure. As we continue our ongoing endowment in Jovante’s name, we help fund the critical work within the Cincinnati Children’s Asthma Research Division. Organ Donation: By working with LifeCenter Organ Donor Network, we are able to continue education efforts on the importance of the gift of life. Education: Our “3.8 to be Great” scholarship fund awards two scholarships to a male and female athlete with a 3.8 or greater GPA. Proceeds from the fundraising events, programs and donations are shared between these three important goals unless otherwise specified. Asthma is the fasted growing disease. Since 1980 asthma has grown 80%. Every day 11 people die from asthma. So far, the foundation has donated over $100,000 to Cincinnati Children’s Hospital asthma division. You can help the Jovante Woods Foundation in many ways. On the website, you can donate, buy gifts, offer to volunteer, participate in fundraisers and contribute to a sponsorship. If you like the Bengals check out the JWF shop where there are lots of Bengals related items. All of the items are autographed by Ickey Woods. The foundation also has fundraising golf outings. The one in Dayton is the second Monday in May each year at NCR Country Club. After Ickey was done speaking, the CNO golf committee gave him a gift with a reminder on it that they expect him to participate again in our golf outing next year on July 15, 2019. You can contact the foundation by calling 859-JOV-ANTE (859-568-2683) or sending an email to mailto:ickey@jovantewoodsfoundation.org. It was such a pleasure meeting with you today. I appreciate you writing about the Foundation in your newsletter, that is very exciting. I want to cover our mission, which has three components as described below. Ickey has poured his heart and soul into trying to ensure not one more parent or family has to lose a child due to complications with Asthma. The passion and intensity you were able to witness today during Ickey’s time speaking is the same passion and intensity that inspires everyone involved with the Jovante Woods Foundation. We are looking to make Jovante the recognizable face of Asthma, in doing this it also means Asthma is at the forefront in people’s minds and discussions. JWF wants to push forward research to find a cure, or at a minimum a better way to treat the disease. We are working toward funding an early detection program, which will allow families to catch the disease early and provide education to families, communities and schools. Jovante ensured that he left a legacy, which at his tender young age he may not have fully grasped he was doing by simply selecting organ donation on his license. WOW! What a gift he chose to provide to someone in the event the unthinkable happened. As we now know on August 14, 2010 Jovante did pass away from complications of Asthma. Literally minutes after his parents, Ickey and Chandra, found out they had just lost their child, they also found out he selflessly chose to be an organ donor. Jovante was able to save four lives through organ donation and countless others with his tissue donation. Ickey devotes a good portion of his time speaking to High School students about Organ Donation. If there is a school you are involved with please let us know and we will be happy to set up a time for Ickey to go and speak with the students and faculty. In addition to Jovante “JoJo” being a selfless young man, he was also a straight “A” student athlete. Another portion of JWF is our “3.8 to be Great” Scholarship Program. Each applicant applying for a Scholarship must have a 3.8 or higher GPA and be a student athlete. We have been fortunate enough in the last 3 years alone to give away over $14,000.00 in scholarships to young men and women who meet the criteria. Ultimately eradication of Asthma is the end goal. In the meantime, we will continue our mission to fund research, early detection, better treatments and education of Asthma; Organ Donation; and our 3.8 to be Great Scholarship program. All in honor of one amazing young man, Jovante Woods. Joe Madden Recently installed carbon monoxide detector and it may have saved his and Mary’s life. Everyone should get one or check the ones they have. He says to get one that talks. Greg Griffin The new storage trailer has been delivered and setup for the Christmas Tree lot. Thanks to Roy Barclay, Jerry Stahley and Bill Stone for their amazing work in customizing the new trailer with LED lighting. Kelly Stone Mike Cordonnier is doing well after his 5 bypass surgery. Sleeping is difficult. Myron Rheaume Paid $5 because he is very happy that today’s speaker, Ickey Woods, has agreed to be a speaker at an Optimist state conference soon. Charlie Goodwin Survived his Africa vacation even though he was bitten by a baby lion and and chased by a full sized hippo. Charlie Goodwin This weekend he will be going to Philly for granddaughter’s second birthday. Heavenly Father many times when we are in quiet time with You, we run through happy memories that make us smile. But, lurking in the shadows come the thoughts of our transgressions which make us frown. Let us not dwell on our transgressions with a frown, rather help us accept them with a smile. If it were not for our errors we would not have had a successful life. Mistakes are what made us adjust our goal, our attitude, our direction. We thank You Lord for giving us the nudge to rethink our actions and do what You created us to do. This makes us smile and we pray You smile in turn. Amen! Gary Aiken introduced Don Donoher, who from 1964 to 1989 was the head men’s basketball coach at the University of Dayton. He compiled a record of 437-275. In 1968 they won the NIT championship and in 1967 they were the runners-up in the NCAA. Donoher was the athletic director from 1976 to 1980. Donoher became coach after Tom Blackburn lost his battle with cancer in 1964. Blackburn was head coach from 1947 to 1964. He informed us that the UD Arena renovation is in phase 2 of 3 of a 3-year project. This year, the walk way around the concourse will be moved to the outside walls of the arena. UD thinks they can get another 40-50 years of use out of the original structure with these modifications and save a lot on the way. Donohor played the first game at the UD Fieldhouse when he was a freshman in 1950 under coach Blackburn. It held about 5800 fans. World War II delayed the building of the Fieldhouse. Most colleges years ago were independent and not in conferences. The tournament that existed only served to benefit Madison Square Gardens. The NCAA was created, and they created their own tournament. As a freshman, Donoher mainly sat the bench. His second year he was mostly sitting on the bench, but he still got to go to the NCAA tournament in Chicago. It was the last year a team could play in both the NIT and the NCAA tournament. During this game UD set a record for the most personal fouls in the NCAA tournament with 41 fouls – a record that still stands today. At one-point, Frerick’s was able to create 36 extra seats on both sides of the Fieldhouse by moving both teams benches closer together, but he knew they needed another facility. Frericks had the dream and plans for the facility that he finally got built, UD Arena. Having the UD Arena in our community is huge. The updates facility, which includes air conditioning, will help keep the NCAA First Four. The NCAA knows Dayton knows how to host a tournament and how to do it very well. Who is a player you coached that stands out in your memory? What are your thoughts on Anthony Grant as head coach of basketball at UD? Anthony Grant is Quality from top to bottom and he is going to do well. As a sophomore player he shined. Anthony’s father was 6 foot 2 and a big guy who had 6 kids and he knew how to run a family with discipline. Grant and his team right now are recruiting. Could you tell us about your relationship with Bobby Knight? If there were 10 seconds left in a game, you were down by one point, and you could pick any player you coached to get the ball, who would you pick? Remember the CNO 2.0 meeting is always the third Thursday of the month at 5:30 PM at a local bar or restaurant. The next meeting will be on November 15, 2018 at Nelly’s Taste of Bolivia. We had 42 members and 20 guests in attendance. Greg Fay gave an overview of the fundraisers we have to raise money to give away to youth-based organizations and individuals. Greg Griffin discussed the tree lot fundraiser. Tom Novak and Bob Burkman discussed the Avenue of Flags fundraiser. Tom explained to our visitors that you have the opportunity to volunteer to help deliver flags even if you are not a member. It was announced that the next Build-a-Bear for kids with cancer and their siblings is October 25, 2018 at Children’s Hospital. Volunteers setting up should arrive at 4:30 PM others should show up at 5:30 PM. The event starts at 6:00 PM. Greg Fay discussed that CNO 2.0 wanted to find a way to recognize teachers. The committee came up with the Teacher of the Quarter Award. For this quarter we are recognizing a teacher from Centerville High School. The Centerville High School principals chose this teacher for us. For this quarter, teacher Casey Clark’s name kept coming up. 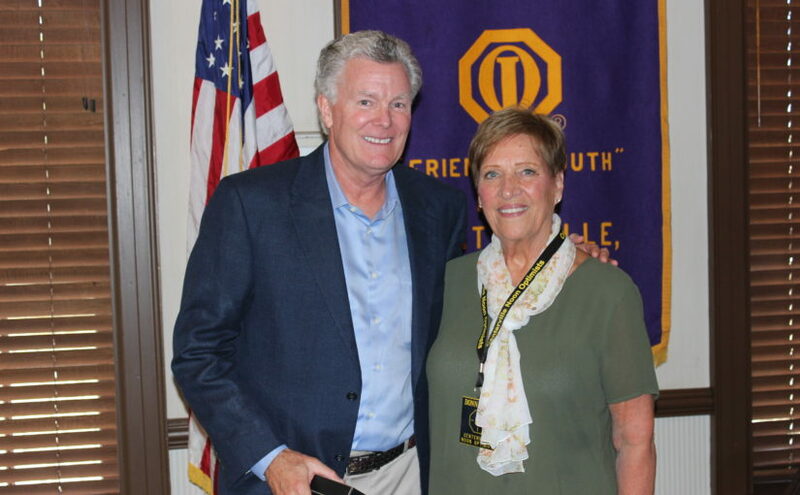 Clark spoke briefly about how great it is to be recognized by groups like the Centerville Noon Optimist. Next quarter CNO 2.0 will recognize a teacher from one of the Centerville Middle Schools. Greg Fay introduced tonight’s speaker. 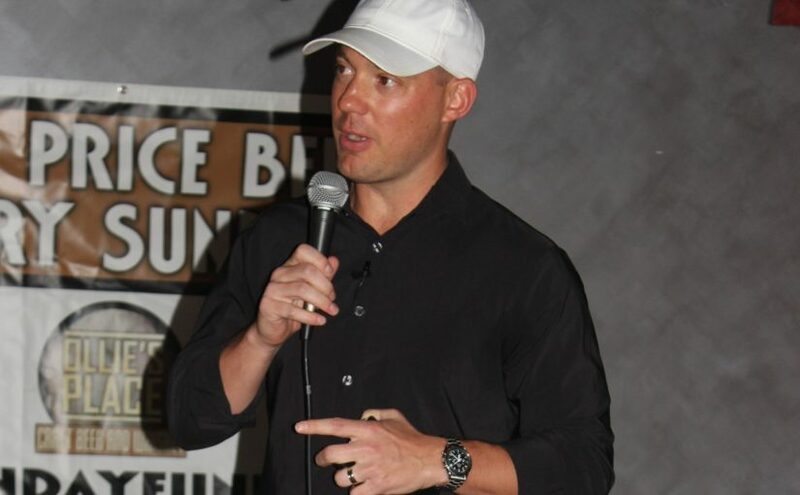 Ryan Hawk creates podcasts and is a keynote speaker. His company is The Learning Leading Show. Ryan is a graduate of Centerville High School. He played football at both Miami University of Ohio and Ohio University. He had a successful run in sales at Lexis/Nexis. He is closing in on 300 podcast interviews of leaders and his podcasts are heard globally. Ryan Hawk runs the Leadership Advisory team at the accounting firm of Brixey & Meyer. During high school Ryan said, “I was recruited by Miami University out of High School. This was at the same time that a certain student named Ben Roethlisberger was also recruited by Miami” Ryan was very driven to succeed at Miami U. He moved to Miami U early, right after the end of high school. The year was 2001 and it was not common for players to do this. He moved in early so he could go around and meet players and coaches and at the very least learn everyone’s name. He wanted to be the best. During his and Ben’s Freshman year at Miami University, there was a senior who was the starting quarterback. For their Sophomore year, the coaches waited until the last minute to inform Ryan and Ben that they would be rotating the position as QB. Ryan said, “Sometimes you can outwork your competition, but still not win. This is an important lesson to learn early in life. The experience of playing with Ben though was still worth it and it has helped propel him through my successes after football.” After a few games Sophomore year, it became clear that Ben was the better quarterback. Ryan was offered other positions on the team, but he decided to transfer to Ohio University and became their starting quarterback. In order to earn the starting QB job, he used the same technique of moving in early to learn everyone’s name and earn their respect. This was not simple because Ohio University considers Miami University to be its biggest rival. Ryan had a successful run at Ohio U, but he did not make it into the NFL. He did play for the arena football league for a brief time. During his success in the sales world he got to meet business leaders like Todd Wagner and Mark Cuban who founded Broadcast.com. Broadcast.com is an internet radio company that was sold to Yahoo! On April 1, 1999 for $5.7 Billion. Ryan then held a question and answer period. Greg Fay asked for interviews that stand out? #1. Kat Cole, the group president of Focus Brands (think Cinnabon). She started working at a Hooter’s restaurant in Florida. She got experience at every job from waitress to cook to manager. She became indispensable at that restaurant and earned her MBA. She was invited to run the first restaurant in Australia and other countries finally becoming executive vice president of Hooters. Ryan thinks she could one day become president of the U.S.
#2. Poker players are Interesting because they win by using their brains, not because of physical attributes. Most are great communicators and great listeners. What are characteristics of Productive Achievers? They are Courageous and Confident. They also have Curiosity and Humility. How did you get going in the podcast business? He landed a job as Leadership Advisor at Brixey and Meyer. He started doing podcasts and lost money for the first year. After 60 podcasts he was finally asked to make a paid speech. He now gets paid to do what he loves to do. Since your brother A.J. Hawk got a lot of attention, did that cause any issues between you? Ryan replied that he and A.J. both won the parent lottery and they both won the brother lottery. They truly are each other’s biggest fans. Being part of a wonderful family has helped his success. Stan Fronzaglia announced that the next Build-a-Bear for kids with cancer and their siblings is October 25, 2018 at Children’s Hospital. Volunteers setting up should arrive at 4:30 PM; others should show up at 5:30 PM. Judy DeMarco stated that Bill’s Donuts is taking donations for relief for people affected by the hurricane in Florida. A semi-truck has been arranged to deliver the donations received to the area. Melissa Deeter from the CNO 2.0 committee announced that at 5:30 on Thursday 10/18/2018 at the CNO 2.0 meeting at Ollie’s the speaker will be Ryan Hawk and the teacher of the quarter award will be given. Casey Wycoff announced that Edward’s Jones is collecting Toys for Tots. She will wrap the toys for you and give them away. Greg Griffin, chair of the Tree Lot, announced that the tree lot setup will be on November 3, 2018 at 8:30 AM. The trees will be delivered by 2 semi-trucks on November 17, 2018 at 8:30 AM. We need anyone that can come that day to come help unload the trees and get the bottom drilled. The tree lot opens on Friday November 23, 2018 at 9 AM. Hours of operation are 1 PM – 9 PM Weekdays and 9 AM to 9 PM Weekends. The tree lot tear down will be Sunday December 16, 2018 at 11 AM. This year’s honoree and recipient of the “Robert J. O’Toole EMT/Firefighter of the Year Award” is Firefighter and EMT Paul Conover. Paul joined the department in October of 2016 at the age of 23 and he is a resident of Centerville. This award is to honor the memory of Ruth and John’s son Robert J. O’Toole. Robert lost his life January 12, 1998 after responding to an accident. Bob Burkman gave details about the award and introduced Bill Gaul, the Washington Township Fire Chief and fellow CNO member. Bill thanked Gary Anderson for starting this award. He also thanked Ruth O’Toole for joining us today. 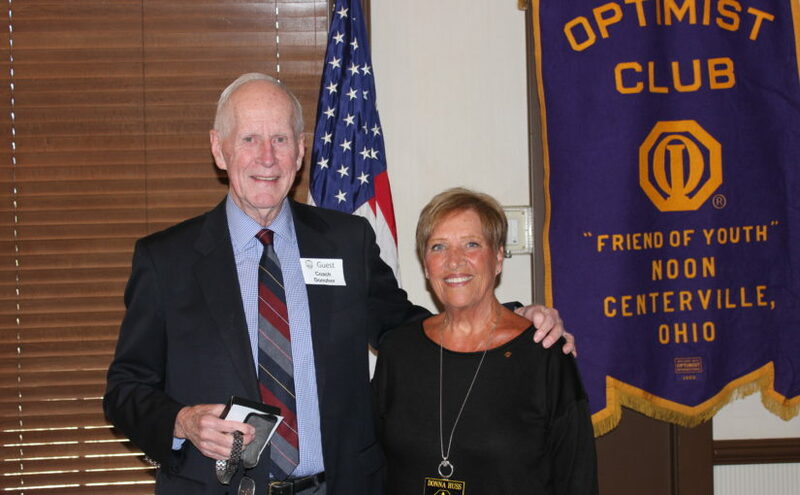 Bill thanked the Centerville Noon Optimists for having this award each year. For 28 years there is a firefighter memorial ceremony each year where now 71 names are read of fallen firefighters. The firefighters recognized are those that died in the line of duty since 1857. The ceremony has taken place for 28 years. They read a name and ring a bell and continue the process until all of the names have been read. Also attending today’s lunch to watch Paul Conover receive his award were: Victoria Conover (mother), Sarah Dolle (fiancé), and Deputy Fire Chief Scott Kujawa. Firefighter Paul Conover is an outstanding Firefighter/EMT who comes to work each shift with the drive and desire to learn and better himself. He is currently working to complete his paramedic certification while continuing to develop and improve his firefighting and EMS skills. Paul follows orders well, completes tasks promptly and efficiently and is always asking for additional assignments and projects. Paul is positive, upbeat, considerate and professional with his coworkers as well as members of the community. Recently Paul has taken on the responsibility of organizing a fire equipment stockroom and is in the process of cleaning and maintaining the equipment. Paul also assists with maintaining training records and hose records. 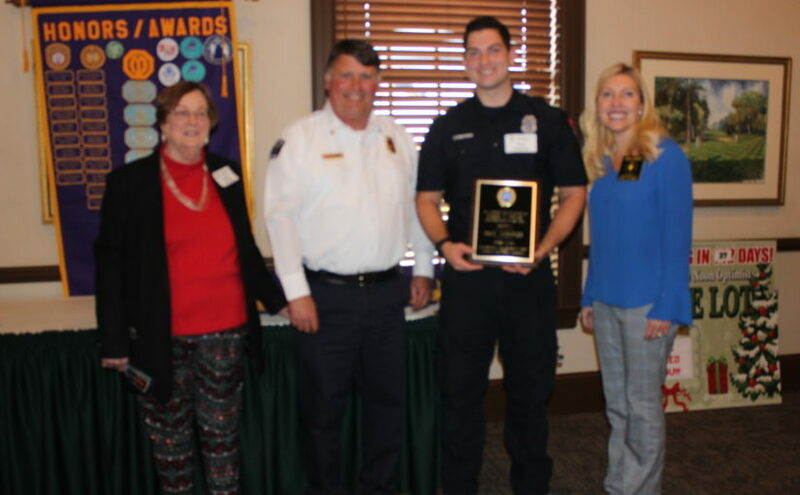 Firefighter Conover was awarded the 2018 Washington Township Part Time Employee Award of Excellence. The award is made annually to employees nominated by their peers who have made a valuable contribution to the mission of Washington Township. Bill Gaul introduced Paul Conover and gave him his award. It was mentioned that Paul Conover received his Eagle Scout rank in 2012. He is currently working on his EMT paramedic certification. Twenty-five year old Bob O’Toole always wanted to be a fireman. He was a part-time Firefighter/EMT with Centerville/Washington Township for four years and had just started part-time with Clearcreek Township in December 1997. With these 2 part-time jobs he considered himself a full timer. He was attending Sinclair Community College for Paramedic Training. His life was taken while in the service of our community, doing the job he loved. Bob O’Toole and John Kalaman’s names are forever linked, as a result of the tragic accident that took their lives. The Tri-Fold on your table describes the events that lead to the deaths of Bob O’Toole and John Kalaman. It also mentions the late Optimist Terry Blair’s influence in establishing this award in 1998. Special thanks to Gary Anderson and Jesse Gaither at Minuteman Press for producing this tri-fold. Today’s Washington Township Fire Department provides around the-clock emergency response with personnel who respond directly from five fire stations positioned strategically throughout Centerville/Washington Township. Shifts are supervised by five Battalion Chiefs and are staffed by more than 50 full-time firefighters, part-time emergency responders and part-time volunteers. Full-time firefighters are scheduled for 24-hour work shifts. 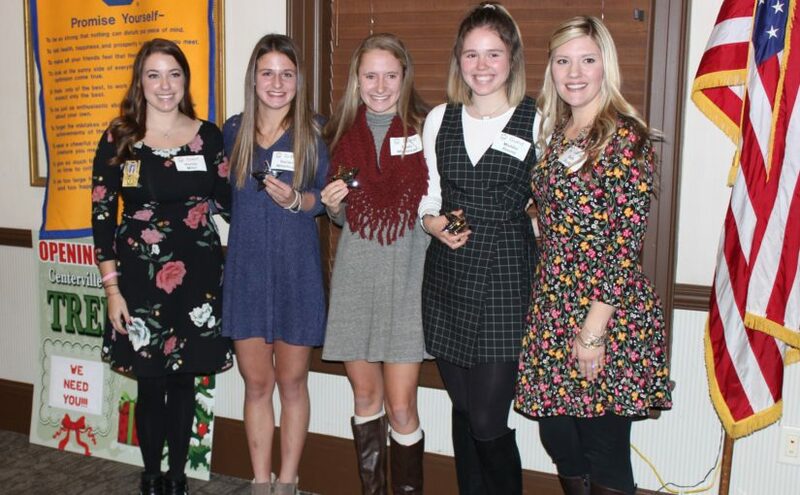 Today Becky Keegan was inducted into the Centerville Noon Optimists. A few minutes later she won the 50/50 drawing! What a wonderful way to welcome a new member. Hopefully Daniel Koons, who was today’s other inductee, wins a 50/50 drawing soon! In Phather Phil’s absence, our Associate Chaplain, David Ladd, delivered one of his “patented” extemporaneous beautiful prayers to start the meeting. Three students from CHS attended today’s meeting on behalf of CHS Spirit Chain: Jalen Bobo, Morgan Colopy and Kat Stierle. They explained the Spirit Chain fundraiser to us. CHS Spirit chain has a friendly competition to raise the most money each year against Fairmont High School. Money collected this year goes to Angels for Anna and the United Rehabilitation Services of Greater Dayton. We donated $600 as individuals and the club agreed to match it for a total for $1200. Greg Griffin, co-chair Christmas Tree Lot fundraiser, announced that the tree lot set up will be on November 3, 2018 at 8:30 AM. The trees will be delivered on November 17, 2018 at 8:30 AM, and we need anyone that can come that day to come help unload the trees and get the hole drilled in the bottom for the tree stands. There will be soups/chili for all the helpers after unloading the 2 truckloads of trees. The tree lot opens for sales on Friday November 23, 2018 at 9 AM. Hours of operation are 1 PM to 9 PM weekdays and 9 AM to 9 PM weekends. The tree lot tear down will be Sunday December 16, 2018 at 11 AM. Nancy Lehren, Childhood Cancer chair, stated that there is a Build-a-Bear meeting on October 11, 2018 at 6:30 PM at Panera Bread in downtown Centerville. The next Build-a-Bear event will be October 25, 2018 at Children’s Hospital in downtown Dayton. The event will be sponsored by CNO members Bill and Kelly Stone. She thanked them for their generosity. Gail Aiken said the “Haunted Trail at Forest Field Park” will be held on October 16, 2018 and October 17, 2018. It is about a 1-mile walk and we need more volunteers for trail guides. She especially needs someone with a loud commanding voice to volunteer so they can announce the rules. Greg Fay, of CNO 2.0, announced the next CNO 2.0 event will be on October 18, 2018 at 5:30 at Ollie’s Craft Beer. The guest speaker will be Ryan Hawk, who runs the Leadership Advisory team at Brixey & Meyer and who is a trusted advisor to leaders all over the world. Gary Aiken introduced Charles H. Simms, president of Charles Simms Development, a builder of homes, townhomes, and condos. He came to talk about the revitalization of downtown Dayton. The Simms tradition from their website is: Four generations of homebuilders in the Dayton area have established the Simms Tradition that is recognized throughout the building industry. With nearly a century of developing some of the finest neighborhoods in the Miami Valley, the Simms family has continually met the demands of today’s homebuyers. Simms purchased his father’s company in 1996. Several years ago, the City of Dayton asked him to start building downtown. They gave him a piece of land next to a parking garage. After some market research they went for it. There was a new demand for downtown buildings. In the first development they built 18 units on 1 acre. This density is not possible in suburbs because of setback rules, but downtown there is plenty of space without the rules. Infill sites downtown are popular because the infrastructure of electric, gas, water, sewer and pole lights are already there. They sold the first 18 units in 7 months. It was energizing. There was no theft of building materials. Simms and his company have built 6 developments downtown for a total of 108 units. Downtown Dayton is making a comeback over the past several years. Most of the townhouses are 3 floors. Twelve of them have 4 floors with the top floor being a sitting room with a view of the river. These units have elevators. He now lives downtown in one of the townhouses he built. Simms mentioned that jobs and population drive new housing demand. There is a great market in Dayton and we live in a great area with virtually no traffic issues. He predicts that for the foreseeable future there will be less development sprawl (suburbs) and more infill (urban/downtown). Inflation in the cost of newly constructed housing has skyrocketed. Construction cost is getting close to $200/sq foot and this makes infill construction more affordable. David Ladd came to the podium before our meeting. We had a moment of silence to celebrate Chuck’s life, a large portion of which he dedicated to our club. Then he told a few stories about Chuck that made us both happy and sad. 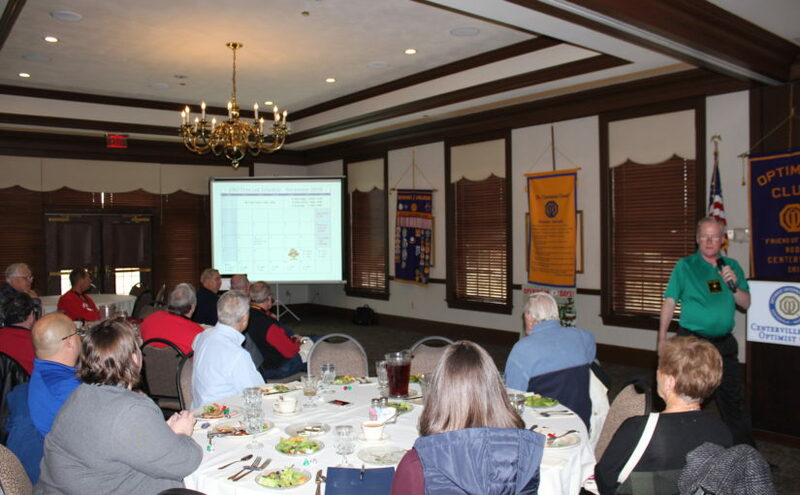 Today is the first meeting Donna Huss has presided as President for 2018-2019 of the Centerville Noon Optimist club. We are lucky to have her and she did a great job. We look forward to a great year under her direction. John Kalaman thanked CNO for being a $250 hole sponsor for the recent 21st Annual John P. Kalaman Memorial Golf Tournament and Pig Roast. The Haunted Trail at Forest Field Park will be held on October 16, 2018 and October 17, 2018. It is about a 1-mile walk and we need more volunteers for trail guides. Roland Rapp has been chosen as the new treasurer for the year beginning October, 2019. Thank you to all that applied, it was not an easy decision. 1st Lt. Rebecca Esselstein, U.S.A.F. is a graduate of Alter High School (Class of 2011 Valedictorian) and the U.S. Air Force Academy (Top Academic Graduate and Top Overall Graduate – 2015) where she studied Astronautical Engineering. She is a native of Washington Township and most recently completed her Ph.D. in Astrophysics at the University of Oxford in England as a Rhodes Scholar. In her spare time, Lt. Esselstein rowed for the Blue Boat at Oxford against Cambridge (2017) She was CoSIDA Women’s Division I Track & Field Academic All-American of the Year in 2015. Her dream is to become an astronaut. Lt. Esselstein’s next assignment is flight school in Texas. Esselstein told us stories that led her to the Air Force and what motivates her. Her stories were interesting, informative and funny! Through second grade she wanted to be a paleontologist. In the third grade she had a unit on space and she was hooked. Since then and to this day, she wants to be an astronaut. She told this to a neighbor and they suggested she consider the Air Force as way to achieve her goal. For several years the Air Force did not interest her, however, by the time she reached Alter High School, she knew she wanted to go to the Air Force Military Academy after High School. Esselstein really appreciated her experience at Alter H.S. She brought with her as a guest today her former Chemistry teacher Barbara Groene who is now Dean of Students at Alter High School. Groene had a big influence on Esslestein. Also able to attend as Esselstein’s guests were her parents, Dr Brian and Lisa Esselstein. At Alter she ran cross country and they won first or second in state each year and they broke records. Being part of the 4×8 track team taught her a lot about team work and she loved the camaraderie of the team. When Esselstein attended the Air Force Academy, the new cadets were about 80% male and 20% female. She described Basic Cadet Training as a process where they break everyone down regardless of gender to their core, then they start the process of building you back up, with the discipline you need to make the military work. Esselstein has always been a perfectionist when it comes to school work. The Academy has a very intense schedule. Your day is pretty full starting with mandatory breakfast. Her only real issue with the discipline of the Academy was the rule for getting 8 hours of sleep. To keep straight A’s she needed extra time to study. Her leader was frustrated with Esselstein’s not getting 8 hours of sleep. They went back and forth many times on her length of sleep. Esselstein was told can you please accept getting some B’s in class and then get 8 hours of sleep? Esselstein was not able comply with this since receiving A’s was very important to her! Esselstein learned how to parachute. They do not do tandem jumps even for beginners. There is intense training and your 1st jump is solo. For her 2nd jump she had to use the backup parachute. Part of her training before this parachuting had taught her to think under pressure, so the backup parachute incident was not a problem. After graduating from the U.S. Air Force Academy as an Astronautical Engineer, she wanted to earn a masters degree. She obtained a scholarship to study abroad at the University of Oxford in the UK. She obtained a Rhodes scholarship. She got her masters in 2 years, but she wanted her PhD which she found out she could get in just one more year. The military originally only allowed her 2 years for getting her graduate degree, but she was able to convince them to let her stay the extra year. Esselstein struggled with Oxford not being totally structured like the Academy. She needed some kind of additional physical goal. She found rowing and became addicted. At Oxford there is a strong and long-lasting tradition for the 39 colleges there to compete in rowing against each other. There was intense competition to make the Blue Boat on the Oxford rowing team. There were only 16 spots in 2 boats available. This was a seven-month process. They were all competing with and working with others at the same time. She did get one of the 16 spots. At the start of the first competition race, she lost control of her oar. The entire team had to stop so she could retrieve and reset her oar. They were still able to finish and not be eliminated that round. For the last year at Oxford in order to have enough time to get her PhD, Rebecca reluctantly had to leave the team. For her PhD she studied how fast stars spin. Soon Esselstein begins flight training in Texas and she plans to become a test pilot. She plans for this to lead to becoming an Astronaut. Her end goal is to the moon and back. She will consider a trip to Mars as long as it is a round trip. Stan Franzaglia Said the word “fine” to a sergeant when asked how he was today. Chris McAlpine Fined $6 since that maximum amount of fines he paid in a day when he president. Cherie Gentry Buying 50/50 ticket with a silver dollar. Larry Lynde Thanks to Don Kelley for leading long range planning for the large 50th anniversary donation requests for the park playground and the library outdoor kids area. Chris McAlpine Happy to just be an audience member at today’s meeting.